But Tamang’s happiness did not last long. And his gratitude towards the supporting organization waned away consequently. “When we first shifted into our new house, everything seemed to be okay. But as we lived on, the walls, windows, doors started to tilt unnaturally. The entire shape of the house was distorting,” he lamented. Nepal Christian Relief Service and Building Company (NCRSBC) had constructed Tamang’s house with funds provided by Samaritan’s Purse (SP), an INGO. All the cost was borne by the organizations while Tamang had to spend Rs 70,000, he said. “At least I would have saved my Rs 70,000 if I knew this would be a house for namesake,” he lamented. Soon after the earthquake of April 2015, which killed about 9000 people, injured nearly double the number and rendered thousands of people homeless, the organization had reached Tamang’s village offering support to build new house for the affected families. The organizations had pledged standard reconstruction and resettlement for the quake victims, locals informed. In Tamang’s ward, Panauti Municipality- 1, formerly Rayale VDC, these organizations have built 157 houses for quake victims using Earth Bag technology that relies mostly on local soil to create structures. During the construction, the quake victims were assured by the organizations that they are building their houses using ‘most reliable and latest technology’. Locals say that the pace of work was very impressive, and as such they didn’t doubt the organizations’ expertise in building strong homes for them though some discussions were held over the ways the homes should be constructed. 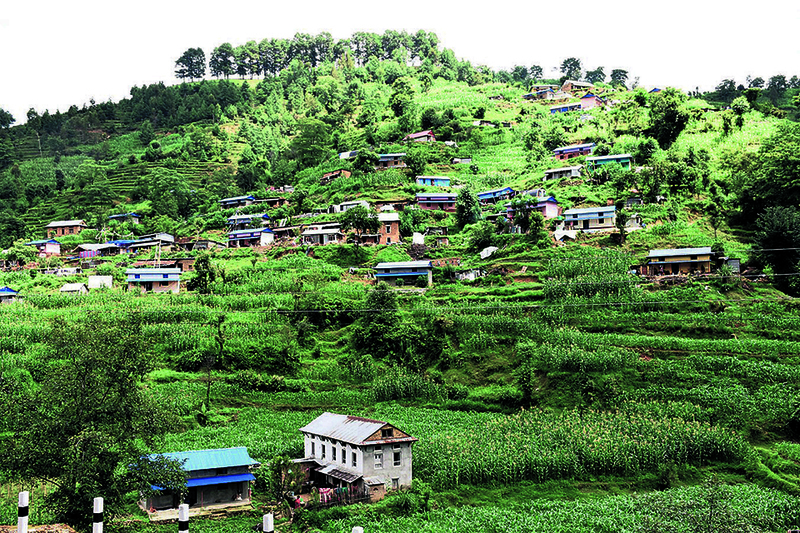 Surya Bahadur Tamang, a member of the ward committee, says it would have been better if the locals had not agreed to the organization’s idea of building Earth Bag homes. “First they told us that they would build house of brick and sand. Later, they proposed to build house of concrete blocks. But in the end they decided to build Earth Bag homes stating that they were earthquake resistant and reliable as well,” he added. Reflecting back, Surya Bahadur shared that the quake victims were reluctant to have houses made of sand but then officials from NCRSBC and SP convinced them Earth Bag homes would be strong and convinced to build such homes. “When we objected to Earth Bag homes they told us that they would take care of quality and asked us not to worry. To make the homes strong, they had even agreed to use red soil from Panchkhaal area for the construction but later they did not keep that promise. They constructed the home using local soil without examining its strength,” he shared. “I feel that the walls of the houses are cracking and bending because the organizations were careless in constructing the houses without examining the soil used in the construction,” he added. Because the quake victims had agreed to take support from these organizations, they had opted out of the house reconstruction grant provided by the government. Netra Prasad Sapkota of Aaruchaur was one among those who returned the money to the VDC as ‘his house was being made by an organization’. “They had promised to make a model house and said that all the aspects, including technology, culture, society, etc would be taken care of. But they deceived us,” Sapkota accused. Padam Tamang, another youth from Aaruchur, agrees. He alleged that the ‘high-handedness of the organization’ was actually visible since the beginning. Despite public pressure, the organization was not serious about transparency and accountability, he said. “We had asked for detailed documents of the project from time to time. But they simply kept on with the construction work without paying attention to our concerns,” he said. “They did not heed to our repeated requests for being transparent. Now we want the government to intervene and investigate the matter thoroughly. It’s a serious thing,” he added. Deputy Chief Engineer of Department of Urban Development and Building Construction Ashok Adhikari stated that the organization has been carrying out its projects as it liked. “It cited agreement with the National Reconstruction Authority and said that it has been working according to the government guidelines, but in actuality, it worked as it pleased,” he said. “We had requested for the house designs but they never availed them to us,” he added. Apart from Rayale, the organization has built 237 such houses in Methinkot VDC (now Namobuddha Municipality) also. Adhikari said that the houses did not comply with the government standards. Under Secretary Dhruba Gaida meanwhile stated that the matter would be investigated thoroughly. “I have heard of it, due action would be taken after investigation report comes through,” he said.